As holiday time approaches, I start dreaming of all the yummy treats I will bake up. I love to make delicious cookie trays for parties and as gift, but don't always have a lot of time to fuss around in the kitchen. 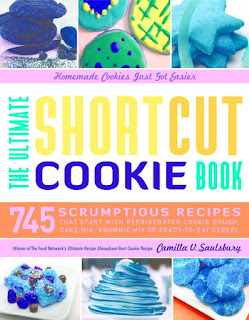 Camilla V. Saulsbury's new book, The Ultimate Shortcut Cookie Book is the perfect solution. I was thrilled when I was given the opportunity to review it. The book is filled with 745 amazing recipes for everything from bar cookies to filled cookies, and everything in between. All the recipes start with a shortcut like cake mix, refrigerated cookie dough, etc. I love just looking through cookbooks and this one is especially drool worthy. I've made three recipes so far: Pumpkin Gooey Chess Squares, Black and Tan Espresso Bars, and Tuscan Cornmeal Cookies. All were simply incredible and easy to put together. You can find the perfect cookie for any occasion and they are all made with a shortcut! how great is that? Camilla V. Saulsbury has several great cookbooks under her belt. She won The Food Network's ultimate Recipe Showdown with her recipe for Exotic Spice Cookies with Ginger, Cardamom, and Rose Water. Her recipes have appeared in several publications, including Southern Living. This lady knows food and her recipes are fantastic! I highly suggest picking up a copy of this fantastic book. I feel like it is a must have for all your holiday baking. 745 cookies gives you a great variety, you are sure to find one you love! I am super excited to be giving away one copy to a lucky reader during my holiday gift guide next month! Be sure to keep checking back for that. Here is the recipe for Pumpkin Gooey Chess Squares. I hope you enjoy them as much as we did! Preheat oven to 350°F (or 325°F for dark-coated metal pan). Position oven rack in middle of oven. Spray the bottom only of a 13 x 9-inch metal baking pan with nonstick cooking spray (or foil-line pan; see page xxiv). Melt1/2 cup (1 stick) of the butter in a small saucepan set over low heat. Beat the cake mix, melted butter, and 1 egg in a large bowl with an electric mixer set on medium speed until well blended (mixture will come together as a thick dough). Pat the dough evenly into the prepared pan. Set aside momentarily. Melt the remaining butter in a small saucepan set over low heat. Beat the softened cream cheese and pumpkin puree in a large bowl with an electric mixer set on medium speed until smooth, scraping down sides of bowl occasionally. Add the melted butter, remaining eggs and vanilla extract; blend until smooth. Add the powdered sugar and pumpkin pie spice; blend until smooth. Spread the pumpkin mixture over prepared crust. Bake for 42–45 minutes (do not overbake; bars should be slightly gooey). Transfer to a wire rack and cool completely. Cut into bars or squares. Cover and store in refrigerator. Makes 24 large or 36 small bars. My favorite holiday cookie is any with chocolate and peanut butter!